The Chinese economy and its global effects are, as we've seen in these pages, a popular subject in publishing. Where's there's money, there's more money, you might say. Most of these books take an empirical stance: here's what happening, they show, and here's what it means, they claim. That's one way of doing it. Another, as exemplified in this book, is to take a systemic overview of the entire economy - not just the stats and data points that consultancies love - and to see it as a culture or a language in which different elements take on meaning. This structuralist viewpoint is more sociological and anthropological than strictly financial or economistic. If you're into French structuralists like Levi-Strauss or Baudrillard, you'll be familiar with the territory. Otherwise, verbal tics like frequent references to "rituals" and "the x of y" (the complexity of culture, the resurgence of the ritual economy, etc.) might be jarring. 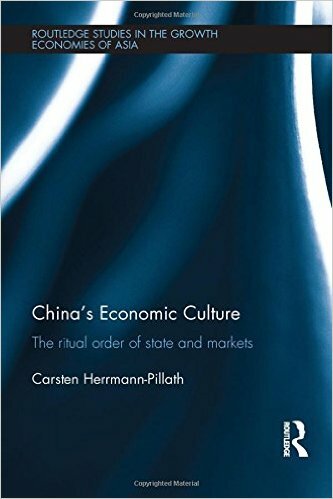 China's Economic Culture is certainly no basic primer on the Chinese economy; it is a serious academic book, with substantial ambition, by one of Germany's foremost Sinologists. Fortunately, China's Economic Culture is both enormously interesting and fascinatingly revealing. Much of the sociological work on China has focused on consumption and shopping (with the noble exception of Michael Griffiths' Consumers and Individuals in China: Standing Out, Fitting In), as the agencies and corporations have sought to understand the people they want to sell to. This book however focuses on work, business, development and markets. (Perhaps not surprisingly, the author is a permanent fellow at the Max Weber Centre in Erfurt University). Seeing the Chinese economic system as "embedded into larger social, cultural and political contexts", Herrmann-Pliath outlines the interaction between individuals and institutions, avoiding the usual Western prescriptions ("for economic success, China must become more like us") and investigates "authoritarian liberalization", drawing strong parallels between modern China and nineteenth century Prussia - which also saw sustained economic triumphs and confounded the existing political order. The book has been produced to Routledge's usual high standards. It is also extensively footnoted (in order to simplify the arguments of each chapter), though in a more essential way than is usual.